The relationship you have with your chin is what you put into it. The amount of time and effort you spend getting to know him and having him gain trust in you will be the mitigating factor in the end result of the relationship. 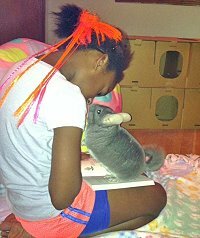 Chinchillas are very social animals as long as you are patient with them and give them lots of love and attention. Just as with people, every chin has his own personality, likes and dislikes. There are very few chins that will be your best friend right away. It is very rare to find a chin that is a 'lap chin'. This is a term people use to describe a chin that acts like a cat or dog and just wants to sit on your lap and be petted and is content just lying there. This is not the normal behavior of chins, so don't expect this, or you will be very disappointed. This is an expectation we hear about over and over again. Even a chin that is very friendly and will allow you to pick him up and hold him for a short time will become restless and want to get down and run around or go back to his home. 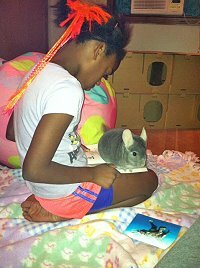 Spend time with your chinchilla. Talk to him every day. He will get to know your voice. I have been asked many times if chins know their names. The answer is 'Yes, of course they do!' Chinchillas are very intelligent animals. If you greet him by his name, he will learn very quickly. Once he has familiarized himself with his new cage, give him some quiet time to eat, drink and sleep since traveling and being in a new home can be very stressful for chins. When you go to check on him, speak in a soothing and reassuring voice. This may sound like a bit much to some of you, but it shows consideration for your chin's feelings by doing things that build a great and trusting friendship. There is a chance your chin may 'bark' his first couple of nights in his new home. This is a warning call and just tells you he is nervous. Once he seems to be comfortable with you coming over to say hi, you can place your hand in the cage and let him come over to you. They are curious by nature and unless he is especially nervous, he will come over to sniff your hand. Do not try to win over your chinchilla by giving him treats! He will come to expect this from you, and you will only succeed in creating a treat junkie. Treats should be a minor part of your interaction with your chin. Base your relationship on trust, not bribes. The chin will usually start to climb onto your hand. Do not try to grab at him. They like to just sit on the open palm of your hand. When he does not appear to be so nervous and comes over to you readily or is even waiting for you at the front of the cage, you can try to pick him up and hold him. He may let you pick him up or may even wiggle a little; this is normal. Just be gentle when handling him and make sure you give full support with the open palm of your hand under his body. If he completely goes crazy and starts to frantically run around the cage, then he is not ready yet to be picked up. Part of this behavior may be based on where you got your chin from and how he was raised and treated. In the wild, chins are more cautious simply because they are prey animals and always need to be on guard and alert. Even though the chins we live with in our homes are born in a domestic environment, part of that instinct never goes away. That is why a great relationship with your chin has to be on HIS terms and in HIS time. One of the biggest mistakes a first time chin guardian makes is lack of patience! Showing your chin patience, having respect for how he lives and trying to see life the way he does will be one of the greatest things you can do for him. There are no words to describe how wonderful a trusting, loving relationship can be with your chinchilla. They are so sweet, affectionate, energetic and just plain silly at times. As much as we love and adore chinchillas, we are very honest to acknowledge that they are not for everyone. Caroline, the daughter of one of our adopters, is spending quality time with Zeus. As you can see, reading with a chin is not easy when he sits on your book! The kisses that follow make it all worth while.